NHL 16 is a hockey video game developed by EA Canada and published by EA Sports. It is the 25th installment of the NHL series and was released on September 15, 2015 in North America and September 17 and 18 in Europe, Australia and New Zealand. The game was released on PlayStation 4 and Xbox One, with a separate release for PlayStation 3 and Xbox 360 titled NHL: Legacy Edition. Jonathan Toews of the Chicago Blackhawks is the official cover athlete, marking his second appearance on an NHL cover, following NHL 11. Toews was originally slated to share the cover with Blackhawks teammate Patrick Kane, however, EA later announced that Kane would no longer appear on the cover in light of an ongoing criminal investigation he was involved in. 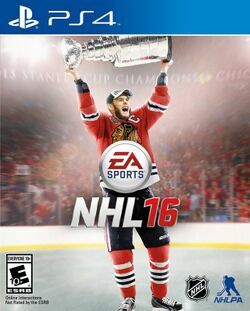 Upon release, NHL 16 received positive reviews and was declared an improvement over NHL 15 by critics. This page was last edited on 1 October 2015, at 15:20.